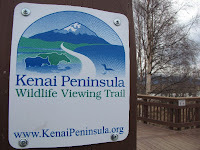 I have arrived at King Salmon, the Gateway to Katmai National Park and Preserve. My time in Anchorage has come to an end. I've had a really great week! Drank some excellent beer, dining out was almost a religious experience, Turnagain Arm is spectacular, and I shopped til I nearly dropped (so of course I had to go drink a another beer). Two groovy t-shirts have been mailed to MY TRAVEL AGENT. I have returned the rental car with no noticeable damage. My cell phone coverage is on hold as of tomorrow. Luggage is packed with clothes, lettuce, crackers, some frozen chicken (extracted from the 245 pounds purchased yesterday) and salsa. I can take my 1/2 gallon of soy bean squeezings beverage onto the Pen Air flight in my carry-on. Kisses to all!!! I'll see you in King Salmon in a few hours. My last full day in Anchorage was full of shopping, shopping, and more shopping - Costco for "frozen, chilled, and room temperature foods," Brown Jug for wine (I bought HOW MUCH??? ), and of course the USGS map store for - you guessed it - maps. I also stopped at Fred Somebody's and bought stuff for this weekend and beyond since my $245 worth of Costco frozen chicken and falafel balls (you think I'm kidding?) and a Volkswagen-sized box of peppermint patties will most likely not fly its way to me until next week or later. Regretfully, that 6-pound quiche that looked so good on the shelf was in my cart for approximately 17 seconds until I came to my senses and put it back. But that wasn't all. I had to arrange for everything except the maps to be shipped via air freight to King Salmon. I'll admit I am an Alaskan bush shipping weiner and so had someone else handle that. I simply brought my purchases to the appropriate counter underneath the big sign "Alaskan Bush Shipping Weiner Line Forms Here" and that was that. When you're grocery shopping for life in the bush you had better be dang sure you know what you're doing. Or, like me, you can just wing it and hope for the best. There is 1 serious question to ask yourself: "Do I really think I'm going to eat this?" There is also 1 serious statement you must repeat to yourself - a mantra, if you will: "I'm gonna have to eat this since there is no store within 295 miles of where I'm going." I hope I like falafel as much as I think I do. 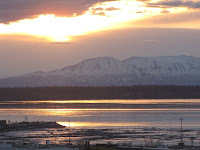 So much to see in the Anchorage area, and so little time to see it. These posts are dated a little funnily (or funny, or funny-like, you choose), since I am on Alaska time which is 2 hours earlier than Mountain time. When I was writing my post for Tues. 4/27, it showed up as Wed. 4/28 UNTIL I changed my computer clock to AK time. I address these issues and then soon all is well in the world. Now we match. 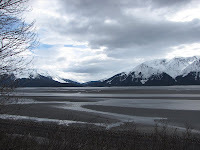 Day-tripping on the Seward Scenic Highway along Turnagain Arm of Cook Inlet took up the better part of an on-again, off-again overcast south-central Alaska late April afternoon. The weather was jacket-cool as I arrived at Potter Marsh, south of town, for some as-serious-as-I-could-manage bird watching. I had my binoculars around my neck and my camera on a tripod. That is so special! 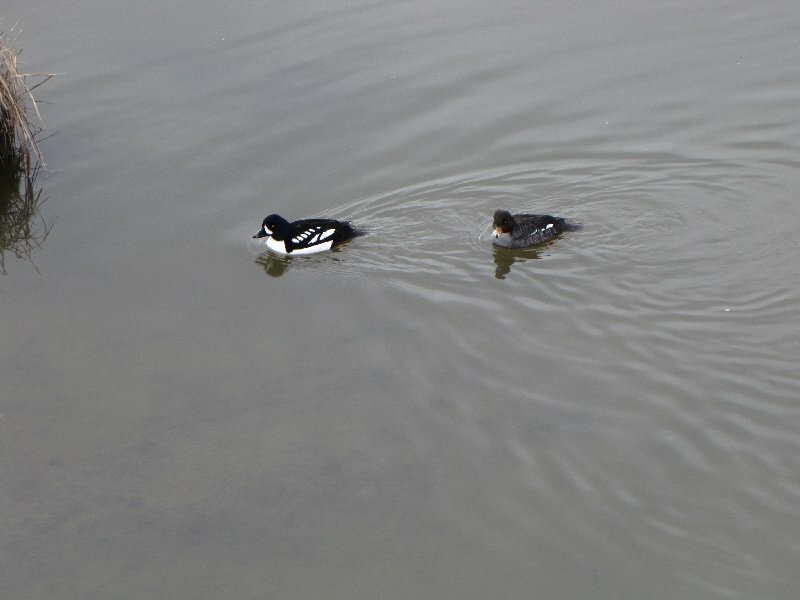 The highlight of my few hours at the marsh were the pairs of goldeneyes who kept dipping and popping as they fed in the water. The black and white of the male was stunning. 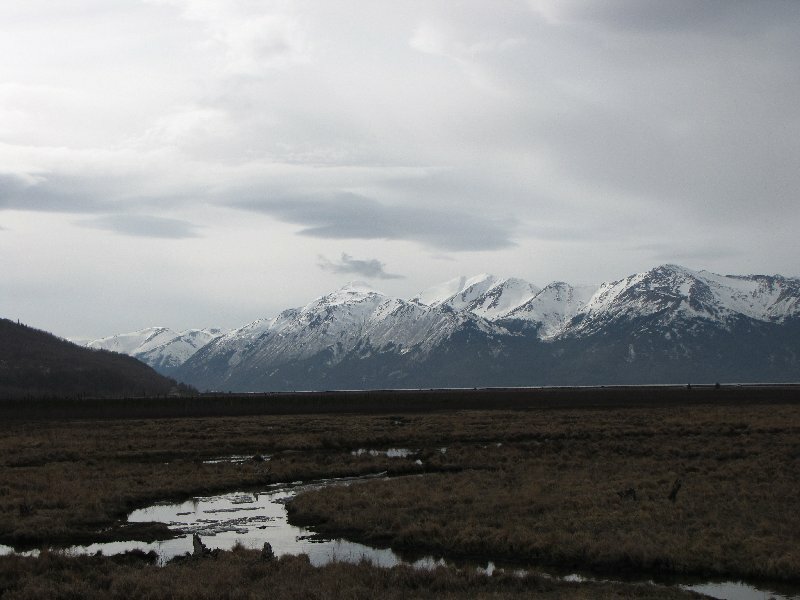 In the distance, the snow-capped peaks of the Kenai Mountains and those of Chugach State Park and National Forest bled a white background into the gray overcast of the late morning. Often just a barely visible dark thread of contrast distinguished mountain from sky. Walking the entire boardwalk took up probably about a mile and a half, round trip. I took it slow and enjoyed just being in this particular time and space. I soon continued driving south, operating under the hopeful assumption that the sky would be a bit clearer later in the afternoon. So I didn't stop at too many viewpoints, instead choosing to drive onward to wherever it was I found myself next. The beluga whale is found in Turnagain Arm and is endangered. There is a place to watch for them at the mouth of Turnagain but I thought it was too early in the season to see them so I didn't stop. 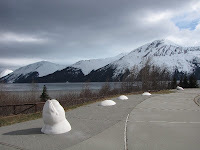 Eventually I realized I hadn't eaten for around 5 hours, and so thought that Girdwood, about 40 miles or so from Anchorage, would be a good lunch stop and turn-around point. The Hotel Alyeska is perched on the side of a valley above Girdwood. My lunch was nice but nothing special. I was the only person in the restaurant besides the waiter. I am not an architect, but I had the distinct feeling that someone was channeling Frank Lloyd Wright when they re-designed the property, with lots of slatted wood accents, wide staircases, and art deco-style carpeting. Very chi-chi and too spendy for my pockets. OK - now for some action! The clouds had cleared, sort of. I figured it was about as clear as I could expect for Alaska. We're not in Utah anymore, Toto. I had earlier seen some road cuts that just begged me to stop and investigate on the return trip. I needed to get out of this drive-by geology mode! There were tons of pull-offs and scenic viewpoints - except where signs stated "Avalanche Area - No Stopping For The Next 2 Miles." Those mountainsides were steep, and I could see avalanche chutes of various configurations zig-zagging their gravitational way down the slopes. The rocks along the highway road cuts definitely looked like phyllite, a metamorphic rock which probably at some time in the distant past had been a sedimentary mudstone or siltstone. That sheen! That foliation! I was in heaven. At Bird Point the phyllite appeared to have been scoured by the last glaciers to have passed this way. Alaska is Alaska because of plate tectonics and subduction of the denser Pacific oceanic plate under the less dense North American continental plate. The mountain ranges that inspire such awe in humans consist of accreted terranes, various size land masses that have been rafted along on the Pacific plate and collided with what was in its way when it met this part of North America. 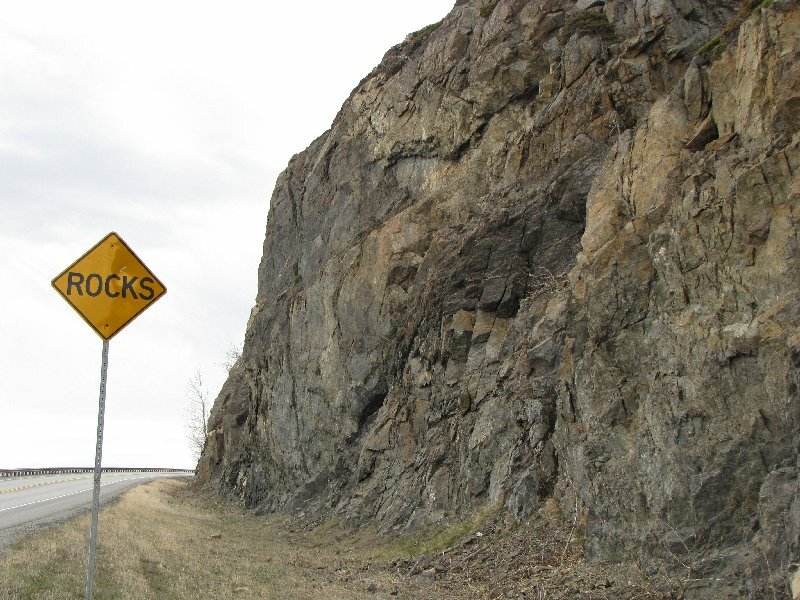 Much of the rock along the Seward Scenic Highway is part of the Valdez Group, believed by some to have been deformed and accreted to the continent by latest Cretaceous age (maybe 80-70 million years ago). Others believe the accretion continued for some time later, into the Tertiary. 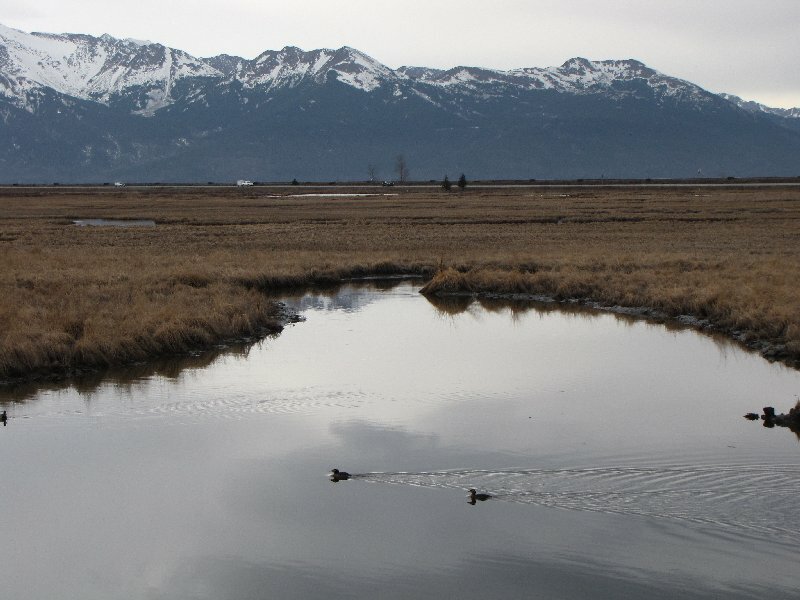 The rafted land mass was deformed by faulting and metamorphosed by heat and pressure as it underwent subduction and subsequent uplift into the mountains we see today in south-central Alaska. OMG!!! 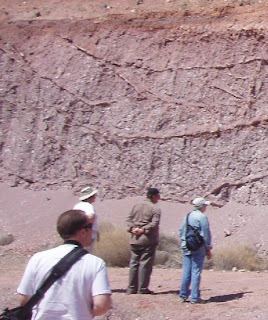 My non-geology friends are probably ready to shoot me! But you all know by now that I really can't help myself. 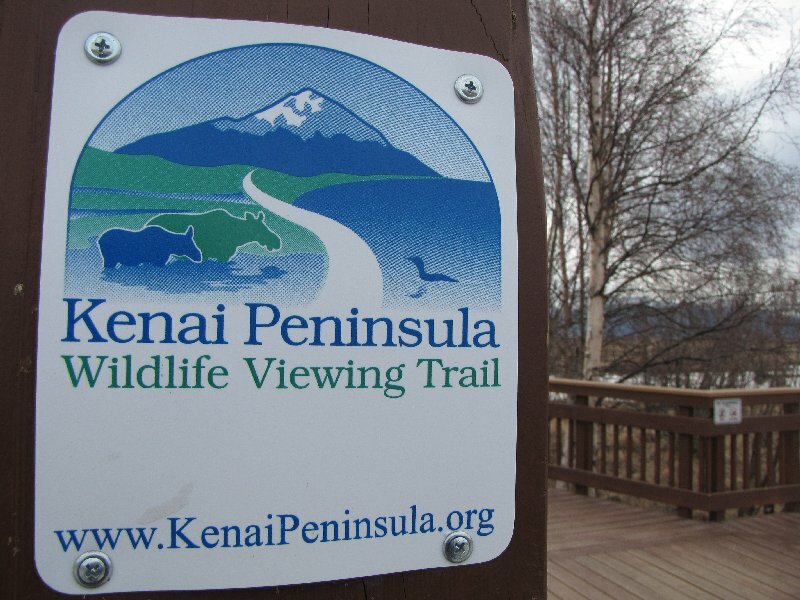 My favorite stop along Turnagain Arm was Bird Point - I spotted 2 bald eagles in addition to being surrounded by phyllite. 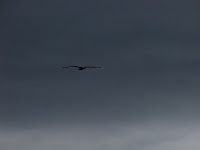 This pic REALLY IS a bald eagle. 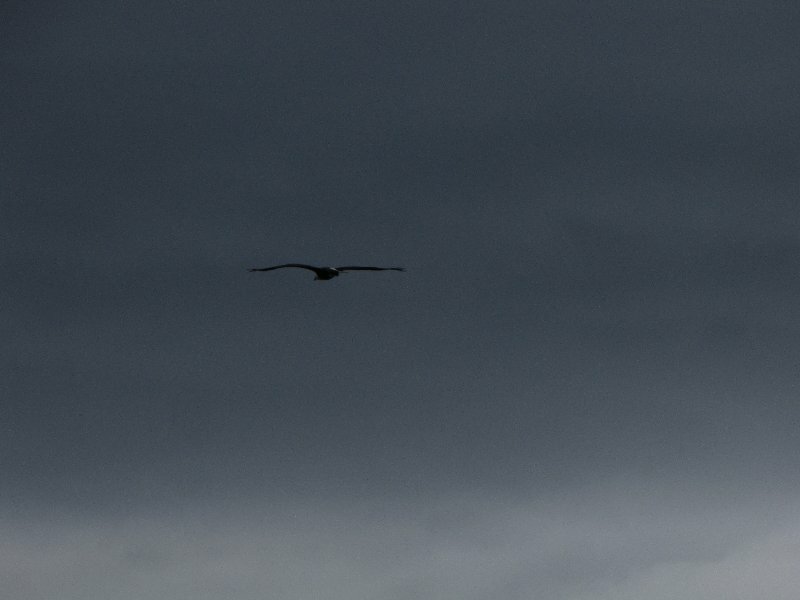 That wing span is magnificent. 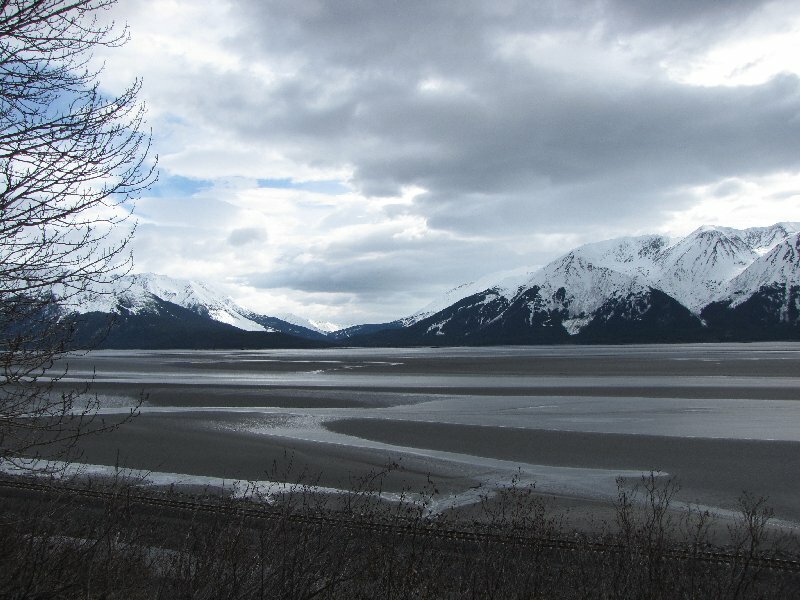 FACTOID: Turnagain Arm of Cook Inlet has the 2nd greatest difference between high and low tides in the world. Huge amounts of silt from Cook Inlet and the Susitna River are brought in on the stronger incoming tide; when the tide goes out again, the silt is dropped as sediment. When I was driving in, the tide was going out. When I was driving out, the tide was coming in. Monday night around 11:00 p.m. Anchorage time, about an hour before we landed, I happened to look out the window of the plane. I was looking eastward and saw something I didn't expect - at our altitude of about 34,000' I could see what looked like dawn breaking on the horizon. I sat there and thought about time, and pondered the rotation and curvature of the Earth at these more northerly latitudes. I am used to 37 degrees north latitude. Anchorage is at 61 degrees north. Brooks Camp in Katmai National Park, where I will be spending the summer, is around 58 degrees north. I have flown at night at the mid-latitudes of the southern mainland US and also of Hawaii, and have never seen the dawn light in the sky in the middle of the night. The image with this post was photographed this evening at 9:33 p.m. from my motel room window. Time of sunset was 9:57 p.m. It is only April 28th, with almost 8 weeks to go until the summer solstice. I wonder what the night sky will be like on that day. Would you like to know what I had for a late lunch today? 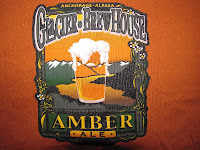 At the Glacier Brewhouse in downtown Anchorage, I started with their Amber Ale. The menu described it as "malty, medium-bodied, very well balanced. Hints of chocolate and caramel." Well, now I don't know if I would have described it quite that way if I had been asked, but it sure was tasty. Medium bodied? Sure. Hints of chocolate and caramel? well, maybe, maybe not. Trying not to slurp my beer too loudly in a public establishment, I perused the menu. WILD ALASKAN SEAFOOD caught my eye. 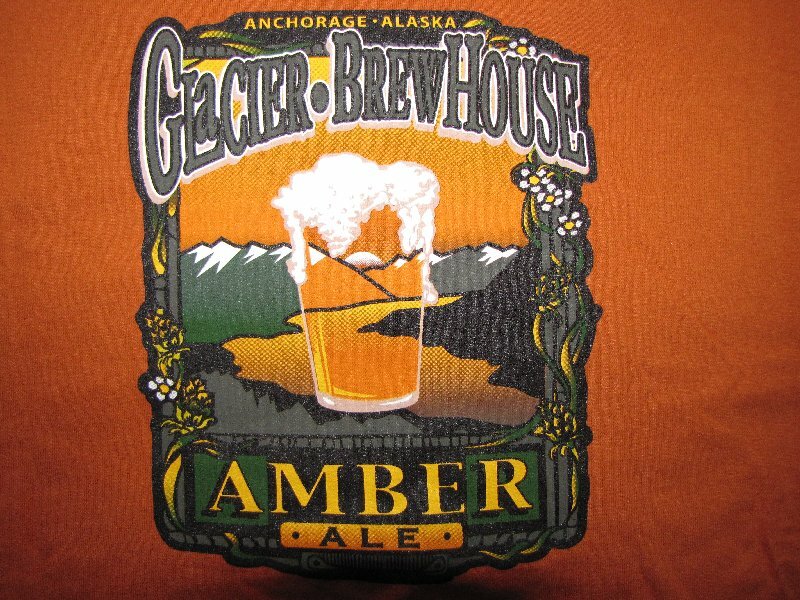 Underneath this heading I read where the owners of the Brewhouse are "proud to support our Alaskan fishermen and are committed to sustainable fisheries." So far so good. Slurp. 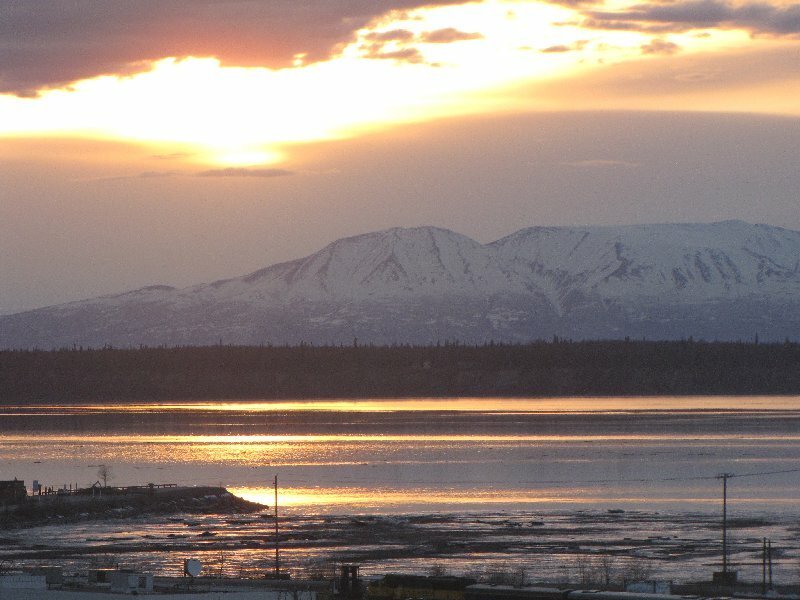 Now, this IS Anchorage. I expected whatever fish I ordered to be pretty good. 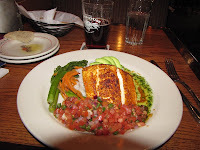 But the BLACKENED ALASKAN HALIBUT that I finally chose was totally beyond merely "pretty good." It verged on the sublime. "Alaskan halibut, three pepper spice, hot soy mustard, ripe avocado and traditional pico de gallo salsa." I was so impressed I took a picture of my lunch. I just don't do that very often, but this halibut had such a presentation on the plate that I didn't even want eat eat it, it was so darn pretty. But eat it, I did. I honestly never wanted that meal to end so I just ate really, really slowly. I was having such a good time that I even forgot about my beer (GASP!!!). I could not believe myself. There were also a few spears of a vegetable that I think might have been broccoli rabe (does that come in spears?) with carrot slivers and white rice. It was the best white rice I have ever had. The soy mustard knocked my taste buds to the moon. I almost forgot to notice the bar, which looked like - oh, no!!! Granite. That's what this meal did to me. I had another beer, bought MY TRAVEL AGENT a t-shirt, and asked the chef to marry me. Lazy morning at the Ramada Inn Downtown Anchorage, for sure! Blew in to town 30 minutes ahead of ETA, at midnight Alaska time which was 2:00 a.m. Utah time. I was one tired puppy dog. Flight was uneventful until descent into Anchorage where we hit some turbulence. Some mild hyperventilating and I was fine. Amenities in "economy class" (aka the cheap seats) are negligible these days (a seat with no leg room; some peanuts and water to wash them down with) but Delta airlines did provide free movies to watch on that seatback in front of you. As I sipped on a Jack & Coke, Jeff Bridges as Bad Blake in "Crazy Heart" was my seat partner of choice while we glided over the Pacific northwest. Loved the music and I was doing some serious chair dancing. According to the cool onboard flight tracking (also available on the seatback in front of you), airspeed was 900-something km/hour and we cruised at 34,000 feet plus change (jeez, they had the altitude in meters too) with an outside air temperature of -57 degrees Fahrenheit. I'm glad I was INSIDE the plane. The journey through Alaska has officially begun. Jeani and Bruce and I said "so long for now" to MY TRAVEL AGENT, who stayed back in St George to fix his neighbor's sprinkler do-hickey. I also said "So long for now" to the Colorado Plateau/Great Basin transition zone that is SW Utah, and plunged headlong into the Mesquite (NV) Basin and out through the fault-block mountains and valleys of the Great Basin. There is very little of geologic interest about the LV spaghetti bowl on I-15. 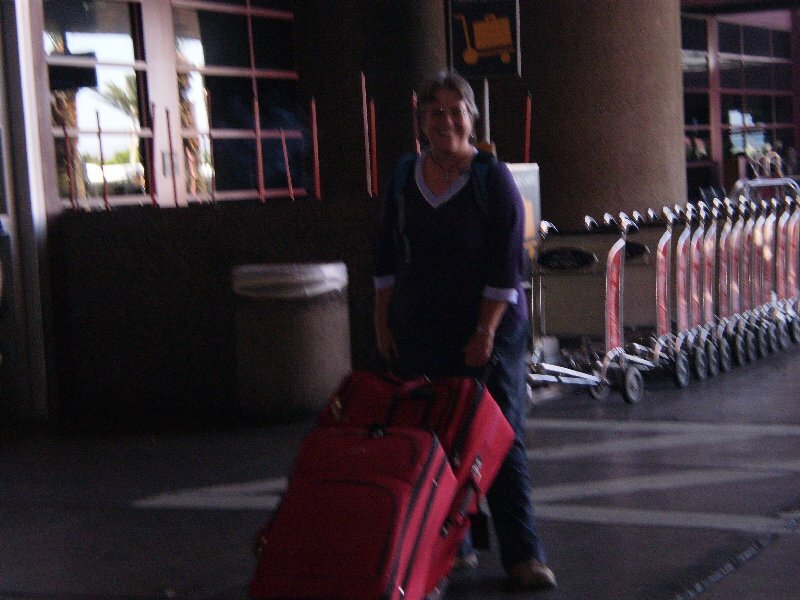 We found our way easily to McCarran airport, but after driving 2 loops around the grounds, we never found short-term parking and, after hugs, kisses, and a few pix, I was left curbside by Jeani and Bruce at Delta departures. Check-in at the kiosk was a breeze. I paid my $60 baggage fee without blinking an eye. Q: How much does a 20-ounce Sam Adams draft cost at McCarran? Enjoy your prime rib, J&B! It was a bunch of fun getting together for an impromptu field trip Saturday with the usual suspects of the Dixie Geological Society. We took a look at some landslide profiles of the clay-rich Petrified Forest member of the Chinle Formation. Ken showed us some great maps of once-proposed-now-defunct development plans on this unstable soil that has serious issues with slope stability! After standing around the landslide profile and chatting in time-honored geologic fashion, we had lunch at a new Mexican restaurant. Sadly there was NO BEER - but we soldiered on with soft drinks, tea, and water. Good fun, friends, and food! Thanks to Ben for being the photographer and letting me post his pix. It seems like I have been packing and thinking about packing and re-packing and thinking about re-packing for this working expedition to Katmai NP for-freaking-ever! Actually it's been only for about 6 weeks. Hey, that's a totally long time to be thinking about packing! What goes in what box? What do I take now? Ship later? How many pairs of shoes can I take? (Notice I did not say "How many pairs of shoes do I need?"). But I believe I've finally gotten things under control. My 23 pounds of checked baggage are each half-packed. I will buy perishables in Anchorage, stuff my suitcases until they each reach the 50-pound limit, and hope the food will arrive in King Salmon at the same time I do, in a relatively acceptable state of frozenness or freshness. I am sooo tired of running around to the post office, to the bank, back to the post office, to the grocery store, get a haircut, and any number of other trips to wherever I needed to go during the past 2 weeks. Plus there still is one more trip needed to go to the post office. ACK!!! OK - Pity party is over!!! What's been most fun is getting together with so many friends and family who have wished me well on my adventure to Alaska. Some geology types have been to Katmai and the Valley of Ten Thousand Smokes - they said it was totally incredible and that I am so lucky to be going there to live for the summer. I've been thinking about this "granite" controversy (me arguing with myself, as usual), and what a person might actually get when they purchase a so-called "granite" counter top. Last night I took a look back at one of my beloved geology textbooks for enlightenment, and what did I find? I know you are just perched on the edge of your seats for this one. 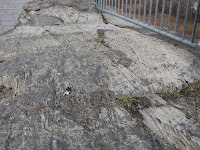 GRANITE DOES EXIST in the IUGS classification scheme. The International Union of Geological Sciences has a LOT of diagrams (probably several million, would be my guess) for figuring out how to classify all sorts of rocks. In the case of our granite, the classification covers coarse-grained rocks that cooled underground (as opposed to fine-grained rocks that cooled above ground, such as basalt). All igneous rocks are classified according to how much of this mineral or how much of that mineral is present. How much alkali feldspar? How much quartz? How much plagioclase? And all these proportions have to be "normalized", and you have to determine the "mode" at which point you determine the "volume percent" of all this plus do some more complicated stuff. So... Inside one of these multitudinous classification diagrams sits a little area called "granite." Be that as it may, what a person gets when buying a counter top still most likely will NOT be granite. If it's black it will probably be a gabbro. If it has a lot of light-colored quartz or feldspar it may be a granodiorite or a quartz monzodiorite. OR... it may be something altogether different such as a metamorphic rock!!! Aren't you glad you asked about granite? Ya just gotta love geologists. We think this stuff is F-U-N. I've always heard that Anchorage is an expensive city in which to stay. In planning my "pre-Katmai" visit to the city, however, I am finding deals and bargains. It just takes patience, a good search engine or 2, and my brother Larry on the computer. There are reasonable rates to be found on hotels.com for all the major chains (Days, Comfort) in addition to local inns with ambiance that includes log structures, moose heads in the lobby, and a view of Russia from the top floor. My criteria for a motel in Anchorage includes free transport to and from the airport, free wi-fi, free breakfast (preferably full but continental will do in a pinch - I can always hoard fruit and muffins for a mid-afternoon re-fuel), and - perhaps most importantly - cheap but not sleazy. I like to travel and stay in motels, but some of them really make me nervous. One time I was on my way back to TN with my Dad and we needed to pull off the super-slab of I-40 for the night. At some forgettable exit in Arkansas we found ourselves choosing between a motel that "leaves the light on" and one that apparently couldn't afford light bulbs. So which did we choose? "Oh lets stay in the old, run-down dive with local color!" My father looked at me like I had been driving waaaay too long, but he just said "Whatever..." and agreed in the end. The worst part of this particular lodging choice turned out to be the piles of peanut shells inside and under the bedside table. Let it be recorded that we did not rest well that night and took off in the morning without looking back. For my Anchorage stay I found a Ramada Inn that meets all my discriminating criteria (What? No free spa treatments or upgrade to the jacuzzi suite?) plus the price is right at $55/night. It's downtown and convenient to that microbrewery where I must check out the bar for its possible granitic composition (hey, we knew there was going to be something about geology somewhere in this post). And here's an FYI for you: if you ever buy so-called granite countertops, beware!!! 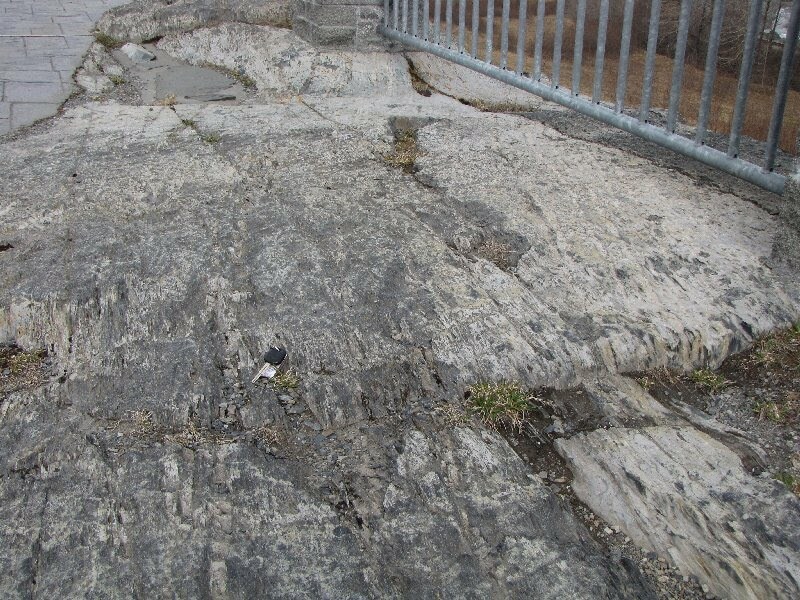 There is no such thing (geologically speaking) as granite. The rock should be referred to as granitoid. I learned this at college so it must be true. PLUS - your "granite" countertop might just be from a metamorphic rock. Love that! "The vastness of Arctic North America is an inspiration to naturalists. It is the embodiment of remoteness and wildness. All the same, as travel becomes easier, the Arctic is becoming less inaccessible; and as naturalists become more numerous, more of them go there. An arctic trip is expensive, however, and travelers want to observe everything there is to observe. Birders don't want to concentrate exclusively on birds, or plant-watchers on plants; to do so would amount to wasting a precious opportunity to absorb the whole arctic experience. There is much to see and savor, and it is well worth making a determined effort to miss nothing." Interestingly, but actually not all that surprisingly, it is much cheaper to fly LV -> Salt Lake City -> Anchorage than it is to fly just SLC -> Anchorage. Same flight number from SLC! I guess if you leave from LV, “they” expect you will come back and eventually lose all your $$$ at the casinos. Or, that you have already been there and lost all your $$$ to the casinos. Either way, for as long as I’ve lived in southern Utah it always has been less expensive to fly out of LV than either SLC or St. George. I don’t gamble, I just take advantage of the cheaper fares. OK so I have my Glossary of Geology and 2 hand lenses ready to go. What else is there for a traveling geologist to possibly need? Oh, right – food and clothing. And of course more books (both reference and leisure). 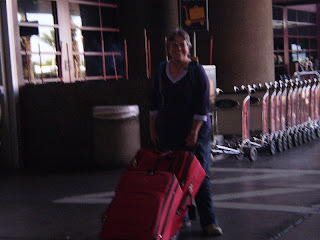 Jeani found 2 nice red suitcases at the thrift store for $15 for both. Bargain!!! However, the larger one weighs in at a mighty 15 lbs, the smaller at 8 lbs. ACK!!!!! My 23 pounds of suitcase cuts a big dent in that 50-lb-per-bag airline weight limit. Books and uniforms are going by a couple of USPS “if it fits it ships” boxes -- delivery time to King Salmon, AK is 3-4 days from St. George. Not bad, especially considering that if you mail a letter in SG to anywhere else in SG, it has to go to Provo UT and then back to SG. This takes approximately 1 week. Really. Ask anyone. I have started rolling up my clothes with rubber bands (that’s what dear old Dad did in the army so it’s good enough for me) to conserve suitcase space. But dang that 50# weight limit for each checked bag!!! I really could bring the kitchen sink if they’d let me. 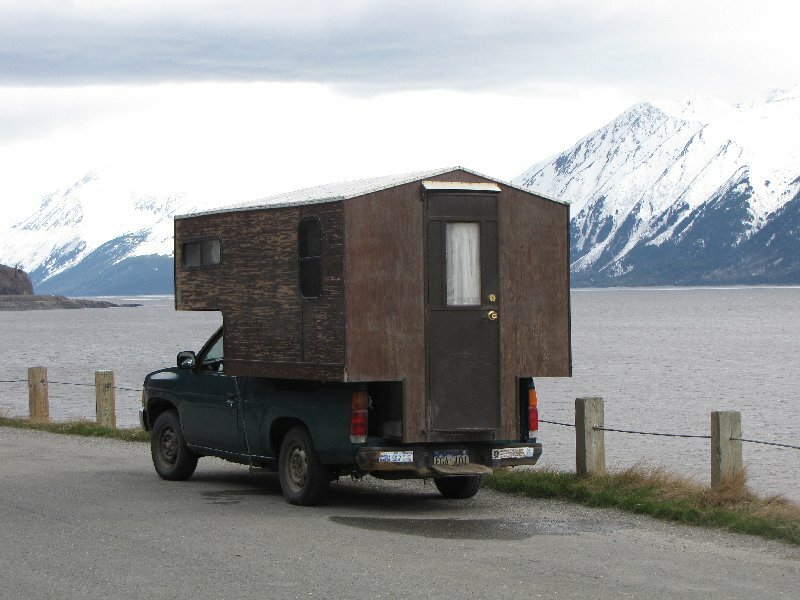 But alas, I am going to the Alaska bush and hopefully will surprise myself by how much “stuff” I really don’t need. Yeah, right. I will need quite a bit of it, however, for the cool, rainy Alaska weather. Rain jacket and pants. Fleece pullovers. Quick-dry fabrics. No cotton (well, maybe a t-shirt or 2). Extra everything (I’ll be a long distance from anywhere). Spare glasses! My uniforms get their own shipping box with my flat-hat packed sideways – but I won’t need that til May 1. Need to order a 2nd pair of leather boots from LL Bean and will have them shipped to AK from ME. Every pair of hiking socks that I own. Winter or summer sleeping bag? Flannel sheets will be real nice in the chill – thanks for the donation, Jeani! What about a pillow? I am NOT resting my noggin on clothes stuffed into a stuff sack for 5 months. Camera and accessories (can I photograph those bears without a tripod? ), laptop to download the bazillion photos I will be taking. And on and on it goes, until I actually have my suitcases packed and extra packages taped and ready to ship. I will manage to bring a small clock radio. The AM radio station from Dillingham is NPR, which I have awakened to since Univ. of TN days in the 1970’s. Some things don’t need to change. Food from home. This is the worst part. It has been suggested to me that I pack at first as if I’m going on a 7-day backpack, for our 7-10 days in King Salmon (where there is 1 convenience store and milk costs $9/gallon – if they have any at all). Big Lots rocks for small jars of condiments in plastic jars (weighs less than glass plus less likely to shatter – or leak, I hope - in transit). I’ll need -- what??? Spices re-packed into small ziploc bags. One bag of granola re-packed into 2 bags. I have to re-pack everything!!! Just a few things will come from home. Larry told me I am not allowed to bring canned tuna and crackers onto the plane for my snack. OK, I am soooo on it.